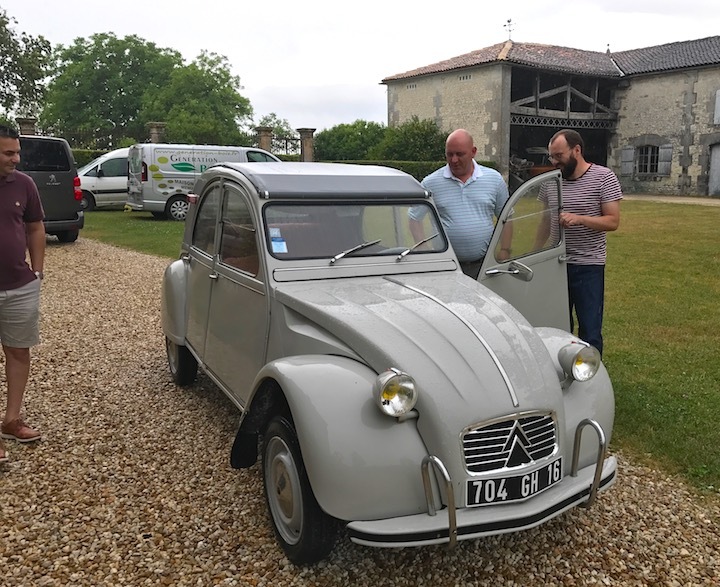 Day 3, Saturday the 24th was spent driving from Brittany to La Rochelle, Christine's hometown. 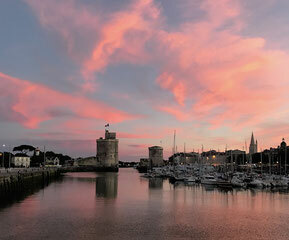 Part of the Bois Ordinaire cognac designation, La Rochelle is also known for its sea salt and outstanding seafood, and it boasts the largest pleasure sailing port in Europe. This was the longest leg of our trip without a distillery visit, but we did our best to make the drive interesting with several stops along the way, including a spontaneous picnic with breads, cheeses and charcuterie purchased at a small village outdoor market. 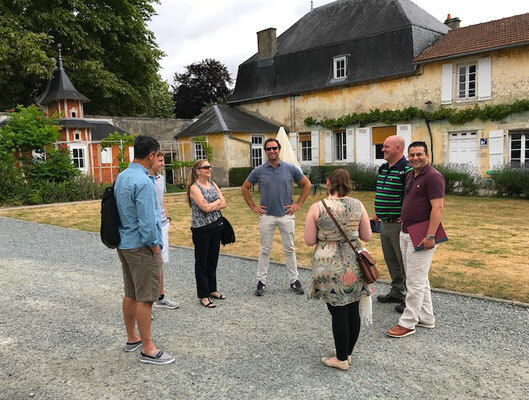 Once we arrived in La Rochelle, the team was given the evening to themselves so they could explore the famous fortified medieval port town and make discoveries of their own. 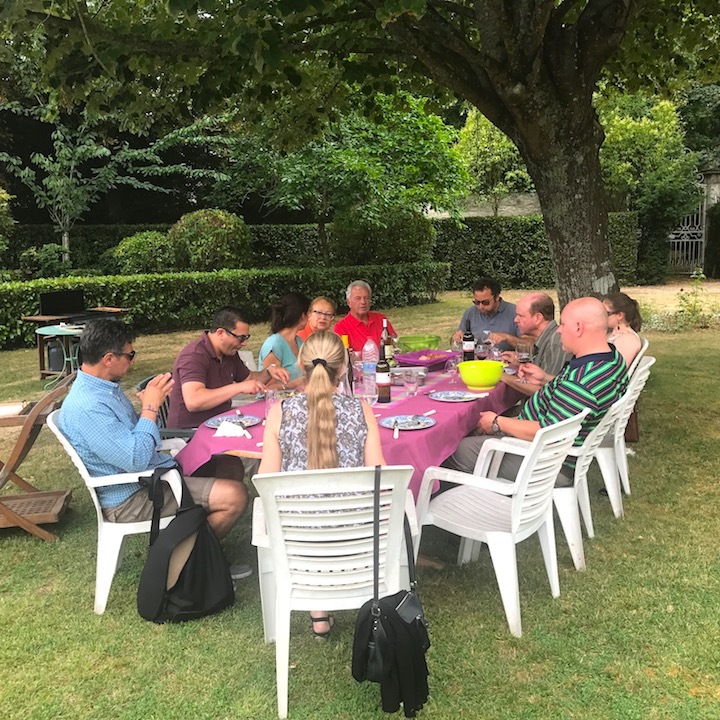 Day 4, Sunday, June 25th - The Heavenly Team was invited for a magnificent back-yard Sunday lunch at the house of Cognac Normandin-Mercier. The menu included La Rochelle oysters, bar-b-que meats and local organic wines from the Charente Maritime. Our visit also included a tour around the family estate. 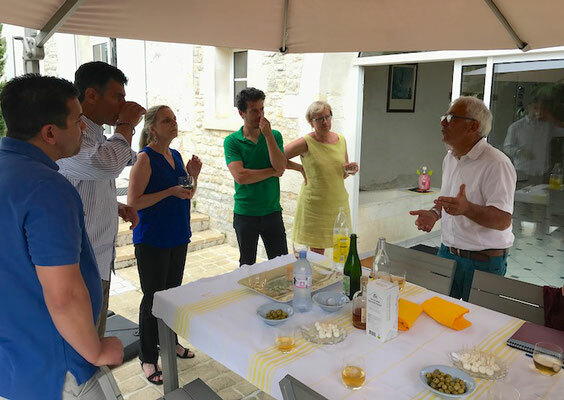 We even had the pleasure of meeting Edouard’s wife Laure as well as his mother and father, Jean-Marie who joined us for the dejeuner. The lunch was delicious, especially the special chocolate covered desert made by Edouard’s mother. 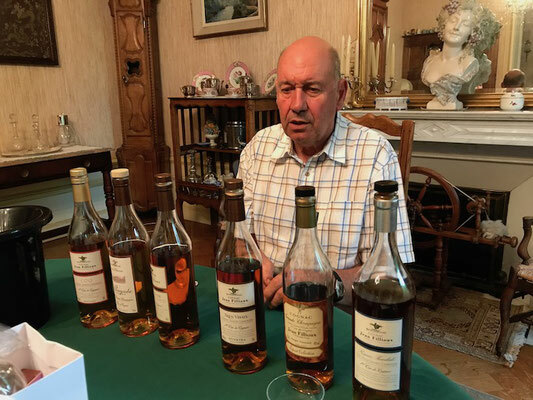 The Normandin-Mercier family has been making, blending, aging and exporting cognac for five generations, dating back to 1872. The estate actually dates back to the 17th century. 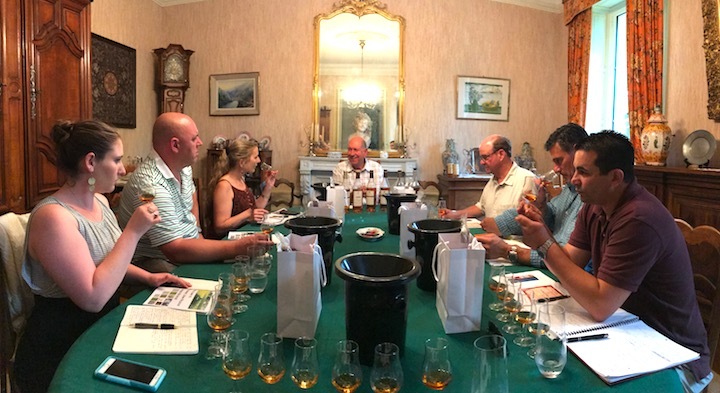 During the tour, we visited the historic old distillery room which is no longer in operation but now serves as a family museum and tasting room. 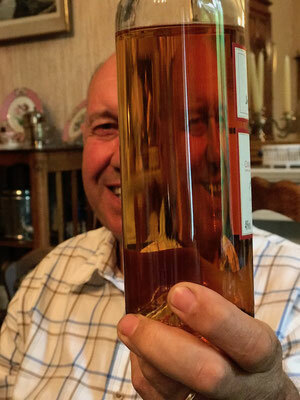 Edouard also took us to the deepest part of his cellars, where even Christine and I had never been; to show us a room he was restoring to become the cellar’s “paradise.” In the bottling room we had a look at some exciting new product ideas still being perfected, and he gave us a sneak peak at this year’s special Christmas Cognac. It was a wonderful way to spend a Sunday afternoon in June and a most enjoyable time was truly had by all. 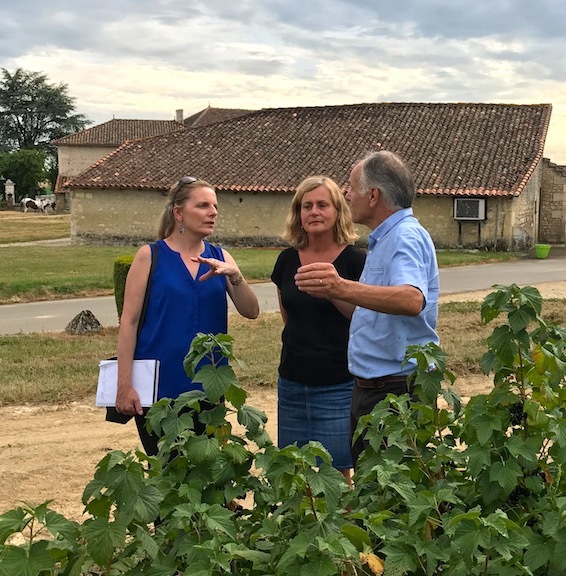 Day 6 - part 1 (Monday, June 26) - Our Heavenly Team Tour rendevoused early morning with Jean-Francois Rault in a quaint village South of Cognac where he cellars a large part of his cognacs. We tasted a small range of cask-strength cognacs right out of the barrels to understand the impact of the wood during the different phases of the aging process. 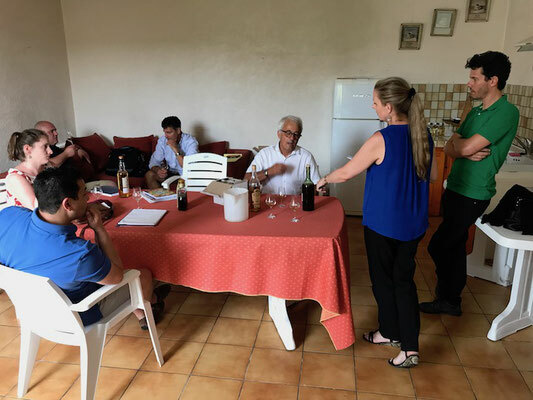 Around noon, we drove back to Du Peyrat's property in Houlette, North of Cognac, in the Fins Bois area , where we were greeted by Jean-Francois’ wife Sonia and their son, Guillaume. 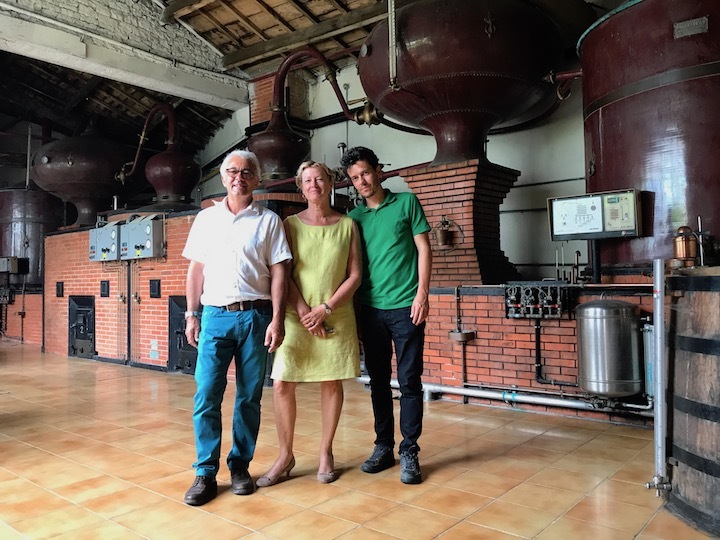 We learned that Guillaume had stepped down from his position at an architectural firm and made the commitment to help his father manage the distillery, representing the sixth generation to carry on the tradition. Sonia was also celebrating her first day of retirement and an opportunity to transition from a long career in education. She is looking forward to further develop her skills as a painter. 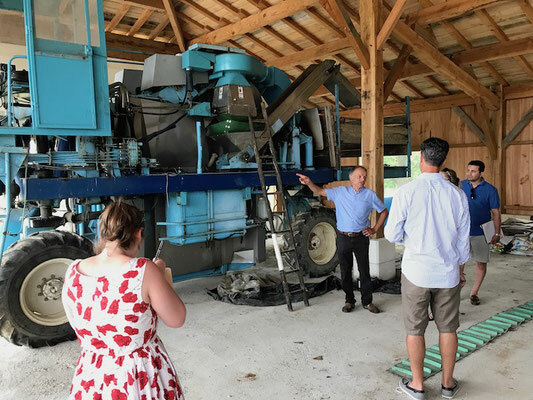 Jean-Francois gave our team a complete rundown on his pioneering methods of organic farming, as well as his family’s long history of distilling for some of the bigger Cognac houses. 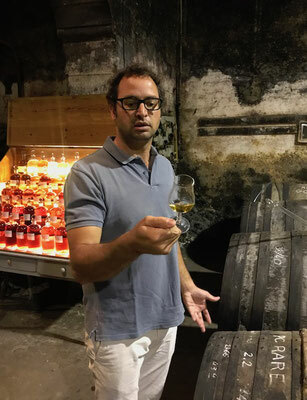 Back at the distillery, we tasted a 1948 vintage, 100% Ugni Blanc at 43% ABV and a fabulous 1929 Fin Bois from Guillaume’s great, great, grandfather, Paul Brisson. Later that evening, this bottle of 1929 was graciously delivered to our hotel room in Cognac as a gift and I am savoring a treasured taste of it now three months later, as I write the accounts of our memorable experiences. Knowing that Jean-Francois was also a true whisky fan, I shared a taste of the rare, lightly-peated ArmoriK Single Malt that David had so graciously given me as a birthday gift. All in all, it was a fantastic visit where we learned quite a bit and enjoyed a wonderfully tasty lunch with the Rault family that featured local, smoked trout from the famous fishery of Gensac-la-Pallue. Distillerie Du Peyrat is without a doubt the best producer of organic cognac to be found, and we are very proud to be representing them to the US market as their popularity grows. Day 6 - part 2 (Monday, June 27) The team drove to Plassac, located in the Fine Bois area of Cognac, where we visited Jean-Yves and his wife Anne, and had a chance to learn all about their wonderful creme de Cassis, creme de Framboise, creme de Pêche, and creme du Mûre. 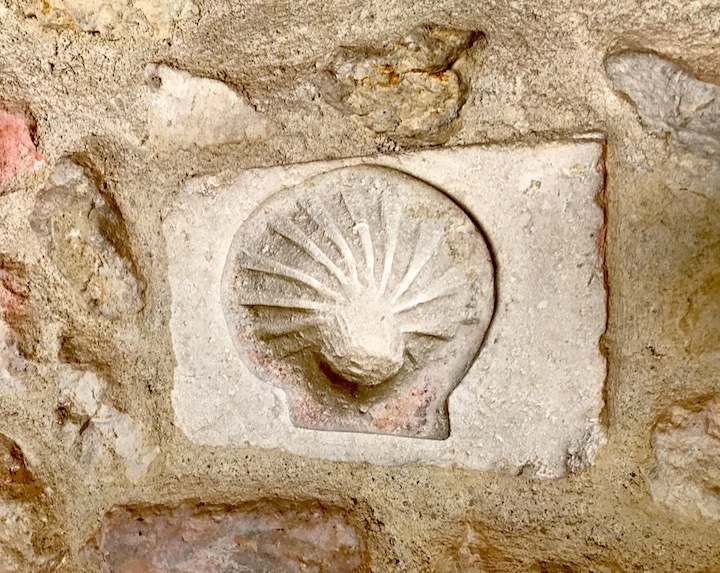 We also had a look at the historic parts of his buildings, that included a room marked with a carving of a scallop shell for pilgrims on their walk to reach Santiago de Compostela. We took extensive notes as Jean-Yves explained the pros and cons of the different varietals of blackcurrants in his orchard. 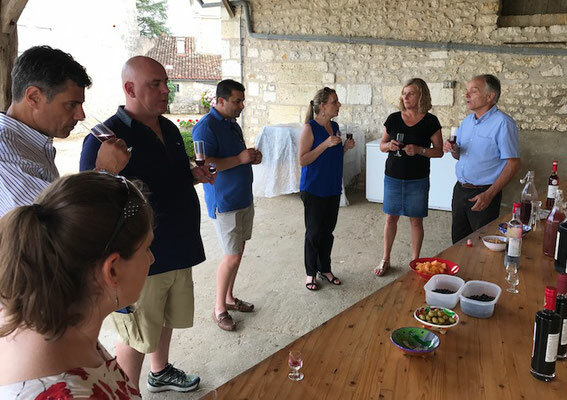 The day ended with a wonderful tasting of fresh grown fruits and delicious sampling of cocktails made with Jahiot cremes. It was framed by a long, late, gorgeous summer sunset. Day 7 - part 1 (Tuesday, June 28) - This day started with a visit to one of the most iconic, family-owned cognac houses in the region, the house of Jean Fillioux. 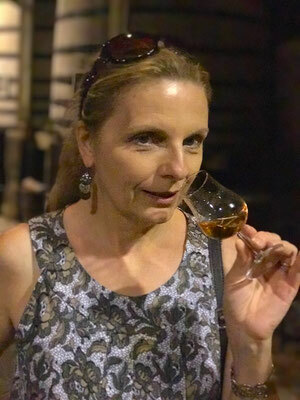 Our stay included a complete tour of the distillery, the vineyards, the cellars and the estate. A discussion started while we were in the cellars about the impact of various types of French oak on aging and by the time we walked to the main house it transitioned into a focused class conducted by the "Magician of Aromas" himself, Pascal Fillioux. 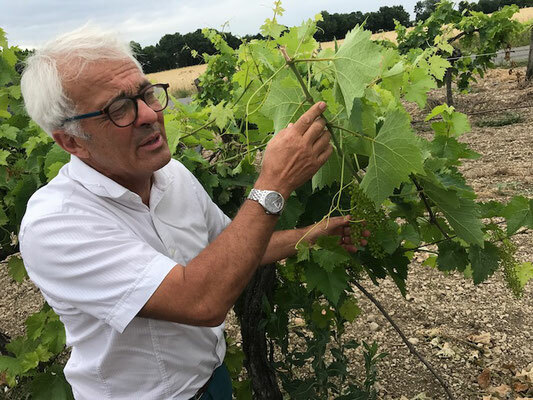 Christophe Fillioux, Pascal’s son, distiller and cellar master of the new generation, had been tending to some work in a different cellar and joined in later on. After class, we enjoyed a wonderful dejeuner “pique nique” attended by both our companies' teams and orchestrated by Monique Fillioux. I say picnic because we had intended to eat outdoors in their beautiful gardens, but Mother Nature wouldn’t have it, so we moved inside. Gathered around a large round table, the dishes kept coming, so many in fact, that we soon could not see the table. Foie gras, rillettes, pate, saucisson, cured ham, smoked trout, home-made tabouleh, Charente melon, three types of fresh bread, all topped off with an array of mini cakes made with cognac and chocolate, each course paired with pineau, wine or cognac chosen for the occasion. Wow, what a “pique-nique” it was! Before we finally said adieu, Paul Scott was invited by Christophe Fillioux to achieve his dream of driving a Citroen, Deux Chevaux (2CV). We laughed as Paul haltingly drove his way out of the courtyard and up the long driveway to the road.